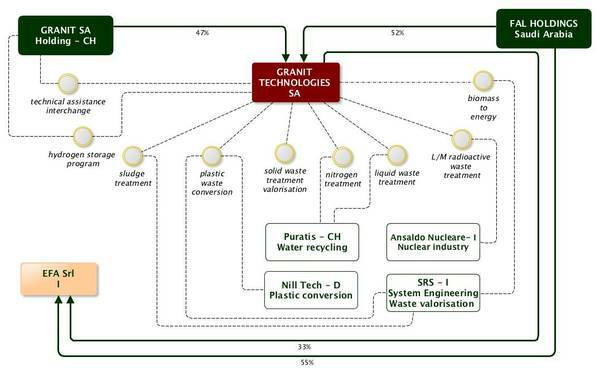 Granit Technologies and Engineering (GRT) SA is a Swiss company based in Orbe. The company was formed in 1981 to encompass the achievements of the Swiss research group Granit SA, a real pioneer in the environmental sciences. The focus of the company was in the fields of water, waste and energies and its mission was to link science and industry, using the technologies protective of the environment and of the human health. Today, the company extensive experience represents a fruitful source of know-how, skills and technical instruments usable in many domains of sustainable development and in various technical areas. Since 2012, the company belongs to FAL Holdings, a major Saudi conglomerate active in multiple domains and engaging more than 4’000 people, and to the GRT Group SA, a Swiss group, active in various fields of the environmental industry. GT&E offices and laboratories are in the TecOrbe area, a Swiss techno-park positioned in the picturesque region of Orbe in Switzerland. The location favours the extension of the collaborative framework to other competences, and this tendency is reflected within the company projects. TecOrbe techno-park has been launched and is co-managed by a GT&E sister company and is fully devoted to the environmental sciences.